Seamer Sports Reserves moved into the next round of the League Trophy thanks to a cracking 3-2 win at Goldsborough United. Seamer took the lead in the first half, when Olly Parker smashed the ball into the back of the net. After the break, Goldsborough equalised through Billy Welford when his header was saved but he followed it in. With 15 minutes to go Dave Welham scored, making a magnificent run before curling his shot into the top corner with his left foot. Bad defending let Seamer back in and Nick Hegarty volleyed home a suoerb effort. Five minutes from time the away team claimed the win when Arran Wright’s free-kick went under the keeper. The United star man was goalkeeper Luke Hansell, while Seamer man of the match was central midfielder Matty Sheader. West Pier Reserves also earned their fourth win in as many games to stay second in Division Two, easing to a 5-1 home triumph against Fishburn Park Reserves. Taylor Jordan led the way for Pier with a second-half hat-trick, Mikey Anderson and Rich Tolliday, from the penalty spot, having scored in the first period for the home side. Shaun Dolan, who started the game in defence but then took over in goal, was Pier’s man of the match. Grangetown Boys Club are still in touch with the top four in the North Riding Football League Premier Division and they showed their credentials by crushing Staithes Athletic 6-1. Boys Club smashed in six, with Anthony Barnes leading the way with four of his own. 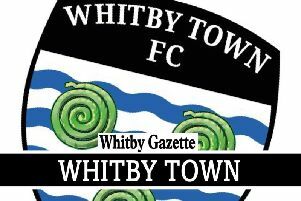 Dan Crawford and Jon Stott added gloss, with Connor Hood replying with a solitary goal for Staithes. Fishburn Park are also in with a shout after continuing their winning run. The Whitby side defeated Stokesley Sports Club 5-2 thanks to a brace from Dan Brown, plus strikes from Alex McGovern, Jimmy Organ-Simpson and Callum Halley. Sports Club boss Chris Lax was left fuming after his side led 2-0 for the first hour of the game, thanks to goals from Reece Allison and Marcus Allen, only to throw things away, later on. Whitby Fishermens are fourth in Division One after James Armstrong celebrated a first hat-trick for his new club in their win over Stokesley. Jake Faichney, a summer signing from Fishburn Park, bagged a brace and Jordan Purvis kept up his good scoring run with the sixth. Visitors Stokesley AFC netted through Michael Gill and Robert Molloy. In the Beckett League, last season’s champions Lealholm have taken over at the top of the first division after a 2-1 away win at Snainton Reserves. Mark McCarthy put the visitors ahead after 18 minutes with a 25-yard free-kick, before Arron Leeman scored after good work by Brad Lewis to double the visitors’ lead five minutes before the interval. Snainton scored after 68 minutes when Rafal Jackow set-up Neil Fryirs to score. The last 10 minutes saw Lealholm have four great chances which fell to Loui Fergus, who hit the bar, Josh Hodgson, who saw his effort cleared off the line with the keeper beaten, and Jamie Nicholson and Lewis, who were both denied. Man of the match was handed to centre-back Scott Templeman. Sleights recorded their first league victory of the season after promotion last campaign when they beat Sinnington 5-2. Sleights took a four-goal first-half lead with goals scored by Joe Hugill (2), Charlie Smith, and Theo Clarke. Just before half-time Luke Balderson scored to pull a goal back for the Sinners. Early in the second half Balderson scored a second for the visitors, but a second Clarke goal for Sleights ended a much more even second half. Sleights’ man of the match awarded was given to goalscorer Clarke.